So many children have a romantic impression of dance (they want to be a ballerina), but this impression along with their enthusiasm for dance frequently gets lost after a single ‘traditional’ ballet class. They are confronted with a rigid class structure, demanding strain on their bodies, and a strict belief in uniformity and exactness. Although many schools have tried to offer creative movement to remedy the need for age appropriateness (ie working with the younger kids), none seem to be created with the sincere intention that Kristin Poulin’s Little Feet Dance program offers. Youngsters become enchanted with dance class and barely realize they are learning skills that most schools ‘drill’ into their students. 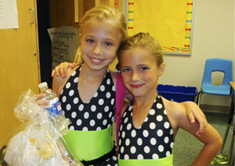 Through playful warm ups, costumes, imaginative story dances, and improvisation students excel. Often times children from other schools transfer to Little Feet and their level of dance development is markedly lower than our students – a testament to our methods of teaching. As children become older, Little Feet gently challenges them more and more. Only at the age when they actively want to learn the steps as steps, do we change the method of teaching. Even then, after learning steps and routines, older dancers are encouraged to interactively participate. Structure is balanced with opportunities to choreograph their own dances. Little Feet also stands alone because it is a unified program. Most dance schools do not have a curriculum. Each teacher prepares classes in their own way. All of our instructors are trained to follow age appropriate curriculum and the mission of the school. When we speak of mission, we mean a mission in the sense of how children should be treated and supported emotionally. It is our belief that children should be treated respectfully as persons who affect others and themselves in good or bad ways. Rather than reprimanding a child, we let them know how their behavior affects the feelings of others. Our mission also includes the belief that children should be encouraged to dance, but never forced. If they are embarrassed or uncomfortable in any way they are permitted to sit out until they feel comfortable. This allows children to experience the joy of movement instead of being uncomfortable with their experience. This, however, does not mean Little Feet has overly permissive classes – children are expected to be functioning members of a group. If it becomes clear that a child is not able to engage on a regular basis, instructors and parents strategize together to encourage participation. Little Feet instructors make conscious efforts to blend gentleness with appropriate expectations.